Part of the Suomalaisen Kirjallisuuden Seuran Toimituksia series. 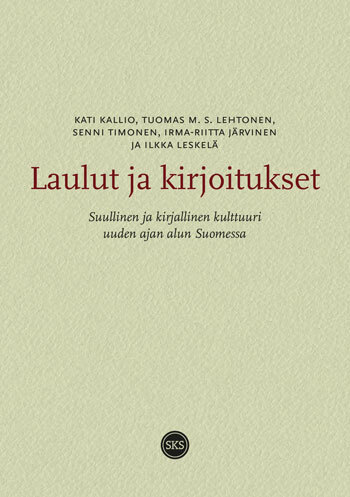 Songs and writings: oral and literary cultures in early-modern Finland renews the understanding of exchange between the learned culture of clergymen and the culture of commoners, or “folk”. What happened when the Reformation changed the position of the oral vernacular language to literary and ecclesiastical, and when folk beliefs seem to have become an object for more intensive surveillance and correction? How did clergymen understand and use the versatile labels of popular belief, paganism, superstition and Catholic fermentation? Why did they choose particular song languages, poetic modes and melodies for their Lutheran hymns and literary poems, and why did they avoid oral poetics in certain contexts while accentuating it in others? How were the hagiographical traditions representing the international medieval literary or “great” tradition adapted to “small” folk traditions, and how did they persist and change after the Reformation? What happened to the cult of the Virgin Mary in local oral traditions? The first Finnish 16th-century reformers admired the new Germanic models of Lutheran congregational hymns and avoided the Finnic vernacular Kalevala-metre idiom, while their successors picked up many vernacular traits, most notably alliteration, in their ecclesiastical poetry and hymns. Over the following centuries, the new features introduced via new Lutheran hymns such as accentual metres, end-rhymes and strophic structures were infusing into oral folk poetry, although this took place also via secular oral and literary routes. On the other hand, seventeenth-century scholars cultivated a new academic interest in what they understood as “ancient Finnish poetry”. The book has an extensive English Summary for the international readership.